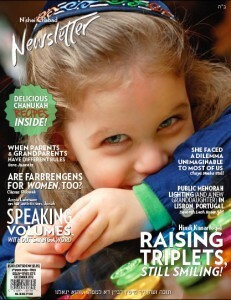 N’shei Chabad Newsletter is always interested in publishing your suitable submissions. If you have been touched by someone’s unexpected kindness or act of courage, please share it with us. To avoid disappointment, please remember that this column is not intended as a way to thank your family or friends for favors or help they have given you. If you want to show them that you are grateful, please send a note directly to them. This section exists to share stories that everyone will find interesting, even readers who do not know you personally. Word limit: 350. Click HERE to email us. Anything on your mind? Do share it with us at. We understand that you want to vent, and that’s what “Open House” is for—but if you keep it constructive and polite, your chances of being printed go way, way up! Word limit: 350. Click HERE to email us. Have comments or concerns regarding what you read in the N’shei? Write a letter to the editor, and send it to us. Word limit: 350. Many of our articles are submitted by our readers. If you have something to say that doesn’t belong in one of the categories listed above, write an article and send it in. You can use our convenient submission form to submit an article. (You may attach a file). You may also submit an article by clicking HERE to email us. N’shei Chabad Newsletter reserves the right to edit submissions for clarity or length. Please be aware that if you do not sign your essay you may not be consulted regarding edits.